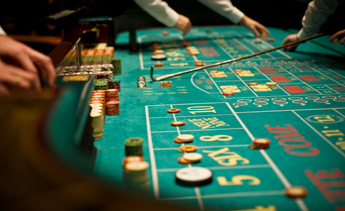 A hard way bet in craps is when a player bets that the number 4, 6, 8 or 10 will appear on the dice, but only if the same two numbers are rolled on each. So for 4, it would be two 2s, for 6, two 3s, for 8 two 4s and ten two 5s. If a player bets on Hard 6 for example and the roller rolls a 5 and a 1, or a 4 and a 2, or hits a total of seven on the dice, then the player loses the bet. He can only win this bet if both dice show 3. The odds that the dealer pays out at for Hard 4 or Hard 10 are 7/1, with the payout odds for hitting Hard 6 or Hard 8 9/1. The reason for the difference in odds is that there are more ways to lose a Hard 6 or Hard 8 bet than there are a Hard 4 or a Hard 10 bet. 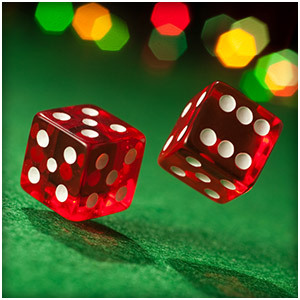 When you watch a game of craps it is tempting to think that these odds offer good value for money as you’ll often notice that the dice will come up with a pair of the same number seemingly frequently. Also the fact that hard way bets stand, until the player rolls that number, or a seven, seems to make them good value. However, the fact these bets offer longer odds than most craps bets should tell you something, chiefly that they don’t offer long term good betting odds for the player and that the house edge for these bets is generally the highest of all craps bets. What this means is that the house has more chance of winning, than you do compared to almost all other craps bets. A hard way bet is fine to use once in a while, but should not form a regular part of a profitable craps strategy.